On your next visit to the South Street Seaport, with its distinctive steep-pitched roofs and bobbing spider webs of rigging overhead, be sure to thank the governor of New Jersey. No, not the currently embattled occupant of that office, but one of his predecessors, Robert B. Meyner, who in the 1950s influenced the Port Authority to move the site of the massive World Trade Center development west to the Hudson River side of Manhattan, and closer to his home state. This fateful intervention spared the early 19th-century structures and waterfront that today constitute the South Street Seaport, retaining a tangible connection to New York City’s maritime past. 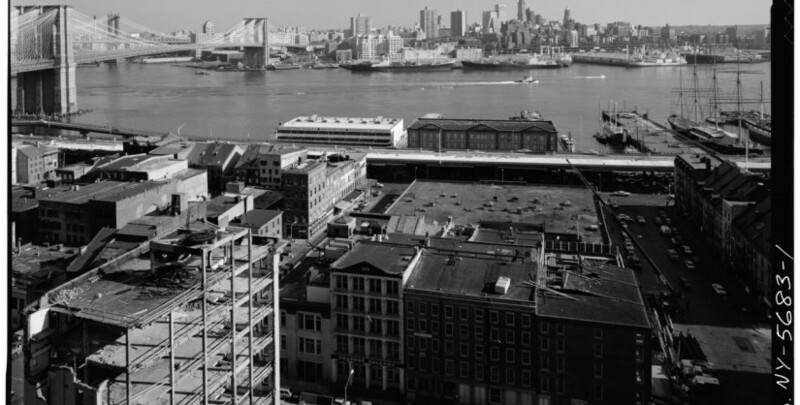 This episode is one of many harrowing moments recounted in James M. Lindgren’s new book, Preserving South Street Seaport: The Dream and Reality of a New York Urban Renewal District, which delves deep into the numerous crests and troughs faced by the historic district over the past five decades. Focusing on the South Street Seaport Museum, which was founded in 1967 at the heart of the district, the story traces the development of the Museum’s novel, community-based vision of a “museum without walls” as it became transformed by both external and internal forces. Because the Museum was charged with the urban development of its surrounding district, the institution’s dreams often diverged from the realities it faced, and these forces eventually left the institution hanging by a financial thread. If the book makes one thing clear, it is that there has been no shortage of trials and travails in the effort to preserve the South Street Seaport. From interference by City Hall and questionable board decisions to undermining commercial interests and a mutiny of the historic ship restoration crews against the Museum itself, the tale is a complicated one, served with a veritable alphabet soup of organizational acronyms. In recounting these tales, such as the Museum’s last-ditch effort to acquire the final vestiges of commercial sailing ships with the vessels Wavertree and Lottie Cooper, Lindgren leaves the reader with a sense of how precious the South Street Seaport’s “street of ships” is as a historic relic. And Lindgren’s detailing of the machinations of the 1970s and 1980s, when the Museum faced diminished leadership and increased economic development pressures, further stresses how close the Museum and the entire district came to losing their souls. Museum co-founder Peter Stanford, benefactors Jack and Peter Aron, maverick Museum chairman Jacob Isbrandtsen, and Peter Neill, Museum president from 1985-2005, emerge as key figures who, despite ongoing struggles, kept the institution on course. While the chapters are loosely themed and occasionally challenge the reader with chronological shifts, the level of research is apparent and impressive. Quotes from Seaport characters such as Captain Jeremiah Driscoll, acerbic observations from Ada Louise Huxtable, as well as anecdotes about Seaport hangouts, visits by Pete Seeger and Brooke Astor, and the Mafia’s presence in the Fulton Fish Market, pepper the book with color and keep descriptions of bureaucratic maneuverings from becoming overwhelming. Overall, the book provides insight for other preservation and urban development efforts. But it is, first and foremost, a tale focused on the particular story of the buildings, ships and, critically, people, that have kept the lamp burning at the South Street Seaport Museum. Brought to its knees by Superstorm Sandy, de-coupled from the short-lived stewardship of the Museum of the City of New York, and facing additional development on Pier 17 by the Howard Hughes Corporation, the Museum today is fortunate to have the fruits of Lindgren’s scholarly labors. Citing the Archive Project’s own Anthony C. Wood, the book notes that historical institutions, in particular, need to be cognizant of their own histories. In looking to its future, the Museum should take some comfort as it looks back. Although its pumps have failed at various points in the past, Preserving South Street Seaport makes it abundantly clear that with devoted volunteers at its core, the Museum has nevertheless remained afloat as a testament to the preservation spirit, a wonder to behold. Bradley J. Vogel, an attorney, serves on the board of directors of the New York Preservation Archive Project and is the former editor-in-chief of the Tulane Maritime Law Journal.